You may be aware of the lighting brand Blaze, they have been ‘blazing’ a trail now for a couple of years in the world of bike lights. They’ve got a bit of a range, the rear burner, the front burner and the one I’ll be reviewing in this write up, the Lazerlight. Keeping safe on the roads morning and evening, on your commute is very important. 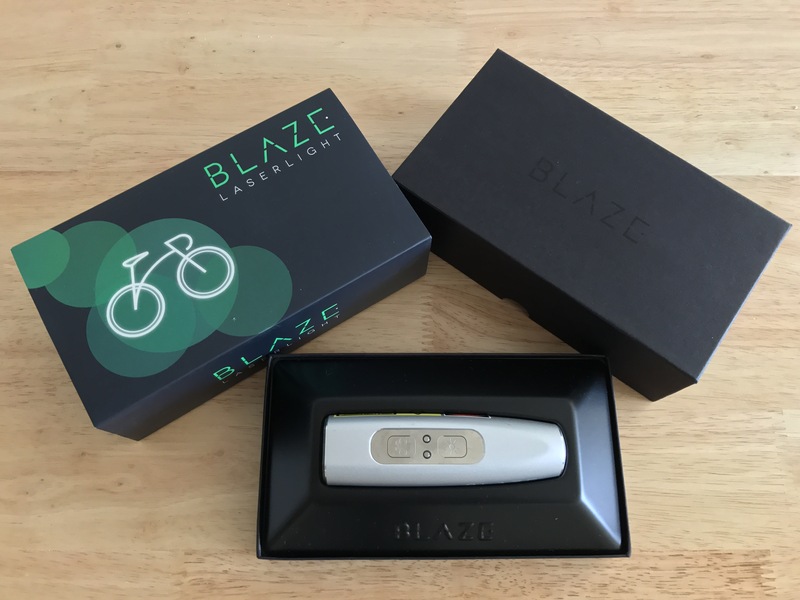 The Blaze team are different in what they do to help improve bike safety with this Laserlight. If you’re a London liver, like me, you may have noticed them on the Boris Bikes (or to give them their unofficial name, Santander Cycles) lately. 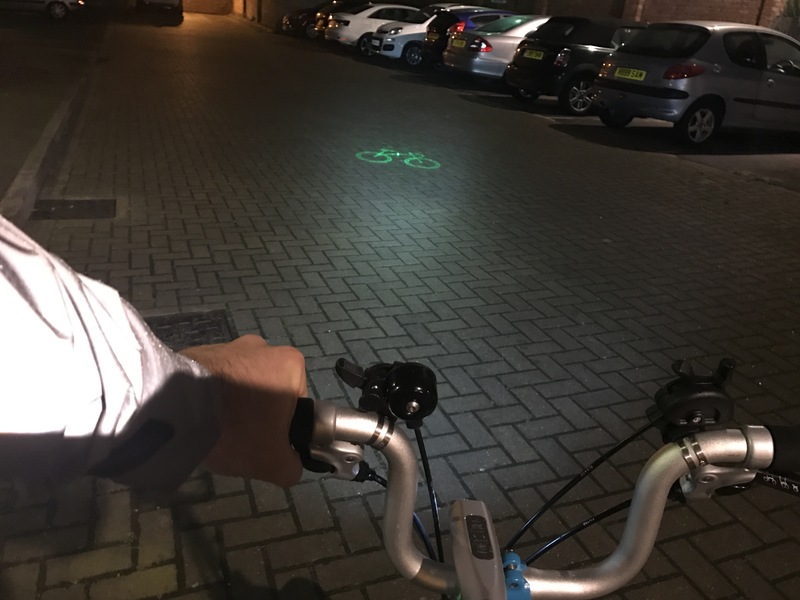 In short, it is a light for the front of your bike which also projects, via laser, a green bicycle on the floor up to six meters in front of you as you ride. What’s the point of it and is it any good? Well for £125 you would ruddy well hope so, if I’m spending that much I want it to last forever and for it to shoot frickin’ laser beams out of it… Let’s see if it can do both of those things! Here’s what I found. 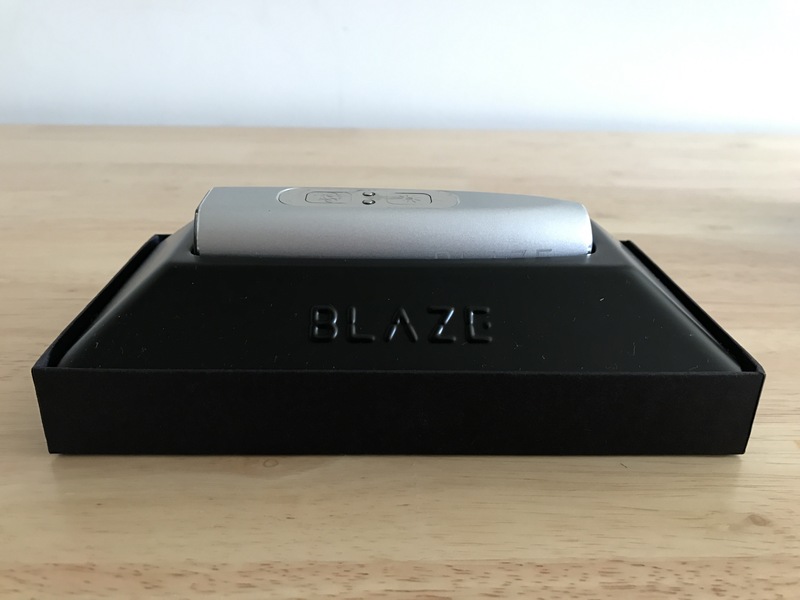 First impressions were good, the Blaze comes packed in a nice looking high end box and as you open it, you’re presented with just the light. It’s got some weight to it but it feels smooth and high end, which you’d expect for the whopping £125. As you get it out the box the first thing you want to do is start firing the laser, which you can’t do until the light is attached to its bike mount, you can however turn the light on. It comes with enough charge to at least test the light with, I didn’t ride it straight out the box but you might be able to get away with it if your ride is short. I would not advise this though, if you’re going to ride with your bike light in the dark, please make sure your light is fully charged, that’s just common sense. Charing is easy, it’s a USB charger so will plug in to your computer/laptop or even a USB plug charger like that of your phone. The charger attaches via magnet to the top of the Laserlight. The Laserlight its self tells you how charged it is by LED lights, which change colour and flash or stay solid to let you know how charged the Laserlight is. Charing is as simple as charging your phone. Attaching it to your bike is easy too, the only thing you should know is you need the supplied Allen Key to fully tighten the light mount to your bike. The light then just slots in to the mount, attaching and detaching easy. So, I guess, unless you’re constantly changing bikes, fully tightening the mount to the bike with an Allen Key should only be a one-time thing. If the light goes on the mount easy enough, which it does, it’s not that much of an issue for me. If you are going to be constantly swapping bikes and lights, keep a hold of that key! Turning the light on confused me a bit, being a bloke I obviously tried to do things without reading the instructions. I didn’t realise there was a lock feature on the light which is turned on/off by holding down both the light and laser button at the same time. The advantage being that the light wont switch on and run down it’s battery life if you’ve dumped it in your backpack/bag – I’ll come back to battery life later it’s a claimed 13 hours… There is a couple of different settings for the LED light, 100 lumens, 300 lumens and flashing. For the laser – on, off or flashing. They’re super easy to toggle through just by pressing the respective buttons. You can have whichever combination of the lights going at any one time. However, this leads me back to the battery life… If you have it on full 300 lumens and bike laser staying on constantly, expect it to run flat in 40 minutes. not 13 hours. Blaze claim on their website that you can get 4 hours at 95% depletion but this is a get me home measure. It seems a bit of a cop out to me, no one takes four whole hours to cycle home, I’d hate to forever be charging my Laserlight each time I get to the office and home from work, as fun as the magnetic charger is. Which brings me back to the price, if I’m paying £125 on a front light only, I want it to work all day long. Not some dim 100 lumens which I worry will get me seen as I’m on my 20-minute commute home. So, with the battery life and cost in mind, is this light just a gimmick? Well, Blaze have released some numbers on the light apparently tests by TRL (Transport Research Laboratory) when a Blaze Laserlight is fitted and the laser is turned on, visibility to a bus driver went up from 72% to 96% compared to an LED light alone. That’s very impressive. Very, very impressive. And TFL (Transport for London) wouldn’t have put 12,000 on them on their Santander Cycles if they didn’t believe in the light. The safety is there for all to see, six meters in front of you. It’s cool and when I was cycling around with it on, it’s not only bus drivers who notice you, pedestrians, car drivers, scooters and other cyclists all knew you were coming. It did make me feel a lot safer on the road and can you really put a price on your own safety? If you’re Blaze yes you can, it’s £125.